John Mayall & the Bluesbreakers was an English blues rock band, led by singer, songwriter, and multi-instrumentalist John Mayall, OBE. While never producing a radio-friendly hit on their own, the Bluesbreakers' greatest legacy is as an incubator for British rock and blues musicians. Many of the best known bands to come out of Britain in the 1960s and 1970s had members that came through the Bluesbreakers at one time, forming the foundation of British blues music that still appears heavily in classic rock radio. Among those with a tenure in the Bluesbreakers are Eric Clapton and Jack Bruce (later of Cream), Peter Green, Mick Fleetwood, and John McVie (who would form Fleetwood Mac), Mick Taylor (the Rolling Stones), Aynsley Dunbar (Frank Zappa and The Mothers of Invention), and numerous other musicians. Mayall used the band name between 1963 and 1967, but then dropped it for some fifteen years. However, in 1982 a 'Return of the Bluesbreakers' was announced, and the name was in use until the band again dissolved in 2008. The name has become generic, without a clear distinction between recordings that are to be credited to Mayall alone and recordings that are to be credited to Mayall and his band. The band that would evolve to the Bluesbreakers in 1965 was formed in March 1963 and became an ever-evolving lineup of more than 100 different combinations of musicians performing under that name. Eric Clapton joined in April 1965, just a few months after the release of their first album. Clapton brought guitar-led blues influences to the forefront of the group; he had left The Yardbirds in order to concentrate on the blues. The first single released by John Mayall and his band, in May 1964, was the song "Crawling Up a Hill", with "Mr. James" as the b-side. The band on the single were Peter Ward, John McVie on bass, Bernie Watson on guitar, and Martin Hart on drums. After the single release, Bernie Watson was replaced by Roger Dean, and Martin Hart was replaced by Hughie Flint. This lineup played on John Mayall Plays John Mayall. After this, the band released a single called "Crocodile Walk", with "Blues City Shakedown" as the b-side. The single was produced by Decca producer Tony Clarke. Roger Dean then left the group and was replaced by Eric Clapton. The group lost their record contract with Decca that year, which also saw the release of a single called "I'm Your Witchdoctor" (produced by Jimmy Page) in October 1965, the first credited to John Mayall & the Bluesbreakers, followed by a return to Decca in 1966. Then in August 1966 John Mayall and Eric Clapton released the single "Lonely Years", with the b-side "Bernard Jenkins", which was released by Purdah Records. The album Blues Breakers with Eric Clapton was released in July; it reached the Top Ten in the UK. Shortly after Blues Breakers with Eric Clapton was released, Eric Clapton went to see Buddy Guy in concert, and being impressed by his trio, the idea for Cream was formed, and he left to form this new group with Ginger Baker and Jack Bruce. Clapton was replaced by Peter Green for A Hard Road, after which Green left to form Fleetwood Mac. Then Mick Taylor joined the group, and they recorded Crusade on 12 July 1967. Soon after, McVie joined Fleetwood Mac and was replaced by Tony Reeves for the album Bare Wires, which was their highest-charting UK album. Following a further album, Blues from Laurel Canyon,Taylor then left to join the Rolling Stones, and the name "Bluesbreakers" was dropped from John Mayall albums. With some interruptions, the Bluesbreakers have continued to tour and release albums (over 50 to date), though they never achieved the critical or popular acclaim of their earlier material. In 2003, Eric Clapton, Mick Taylor and Chris Barber reunited with the band for John Mayall's 70th Birthday Concert in Liverpool—the concert was later released on CD and DVD. In 2004, their lineup included Buddy Whittington, Joe Yuele, Hank Van Sickle and Tom Canning, and the band toured the UK with Mick Taylor as a guest musician. In November 2008, Mayall announced on his website he was disbanding the Bluesbreakers, to cut back on his heavy workload and give himself freedom to work with other musicians. A 2009 solo tour with Rocky Athas (formerly of Black Oak Arkansas) was the first musical venture Mayall undertook after disbanding his former band. Former band member Johnny Almond died on 18 November 2009 from cancer, aged 63. However, in 2009, Eagle Records asked Mayall for a new album, and he put together a solo band including Rocky Athas (guitar), Tom Canning (keyboard), Greg Rzab (bass) and Jay Davenport (percussion) and produced the album Tough the same year. After a year, Canning left because of other priorities. ^ a b c d "The Eric Clapton Lyric Archive – Search By Album". Eric-clapton.co.uk. Retrieved 15 October 2011. ^ "John Mayall And The Bluesbreakers – Crocodile Walk". YouTube. 8 July 2008. Retrieved 15 October 2011. 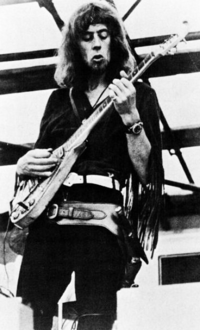 ^ "Roger Dean – Bluesbreaker, Bluejay, Guitarist and more – Timeline". Rogerdean.info. 16 March 1943. Retrieved 15 October 2011. ^ "Artists: J". 45-rpm.org.uk. 10 February 1910. Retrieved 15 October 2011. ^ Doc Rock. "The Dead Rock Stars Club". Thedeadrockstarsclub.com. Retrieved 15 October 2011.